A Cure for Celiac Disease and Other Autoimmune Disorders? 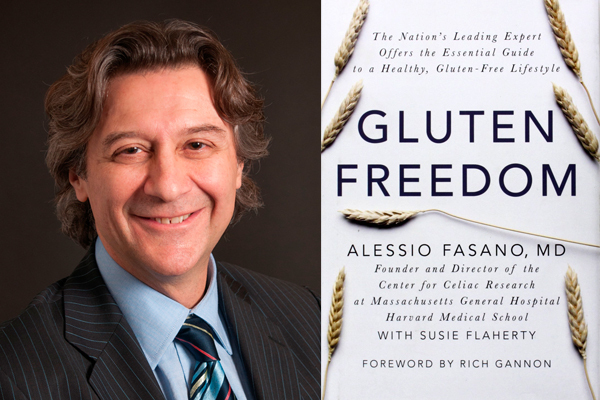 Interview with Dr. Alessio Fasano – Going Gluten-Free. A couple of months ago, I had the special opportunity to interview Dr. Alessio Fasano about a question that many of us have in the celiac and gluten sensitive community. Is it really possible for there to be a cure for celiac disease, and other autoimmune disorders with the same gene type? I was grateful that Dr. Fasano could speak to me by phone, despite the majority of the Boston area being shut down during one of the many blizzards that the Northeast faced this winter! For those of you who aren’t familiar with him, Dr. Fasano is the founder of the Center for Celiac Research, now in Boston, a Visiting Professor at Harvard Medical School, Chief of Pediatric Gastroenterology and Nutrition at Massachusetts General Hospital. And author of the book, Gluten Freedom . Dr. Fasano is also responsible for establishing that celiac disease is a growing public health problem and not the extremely rare disease it was once thought to be. In addition, he has helped to establish that gluten sensitivity is indeed a legitimate disorder, and not a condition made up by hypochondriacs! Heather: Dr. Fasano, I’m very honored to have this opportunity to speak with you today! Fasano: The pleasure is all mine. Thank you for having me. Heather: One of my community members approached me about an article she saw which talked about a new “celiac-curing” vaccine. She asked me what I thought, but since I am not a doctor or a microbiologist, you were the first person I reached out to, to help us understand its potential. Then, after we set up the interview, I went to Facebook and posted in a few gluten-free groups asking people if they had any questions for you. Boy, did I get a ton of questions! As you can probably imagine, I had people asking right away where they could sign up to be a guinea pig for the vaccine trials. On the other end of the spectrum, I had people saying they wouldn’t touch the vaccine with a ten-foot pole! And then there’s everyone else in between who are interested but want to know so much more. So hopefully you have time today to answer everyone’s questions, including whether or not such a vaccine is actually feasible. BUT, before we get to the NexVax2 vaccine, I would like to talk about a different drug, Larazotide acetate. This drug has the potential to heal leaky gut, a condition that I wrote about a couple of months ago. I am excited about its possibility, and would like to go over that with you a bit. Can you explain what leaky gut is, for people who are not familiar with it? Fasano: Sure. So the intestine is a very long tube. Roughly 17-20 feet long in adults, and is covered by a single layer of cells. That’s it. That is pretty much what divides us from the uncontrolled passage of potential enemies from the extreme environment, where both good and bad things exist. Being exposed to these enemies can create problems for people, leading to conditions like celiac disease. So the only thing that defends us against these uncontrolled pathogens or bad guys, coming into our body, is this single layer of cells. Until the recent past, we thought that these cells were all cemented together, like a sort of brick wall. So in order to get into our body you had to come through these cells. Only in the recent past we realized that in between cells there are no walls, no grout between the bricks, rather there are gates that can be opened and closed at will, and if they are stuck open then it becomes a condition of increased permeability or leaky gut that can create problems that can be very different from one individual to another. And what that means is that we don’t have any capability, like we do under normal circumstances, to be protected against this uncontrolled passage of bad guys, that can instigate problems that vary from one individual to another, depending on what kind of genetic makeup you have. Heather: So to reiterate, leaky gut is basically when there are holes, or passageways along the intestines that normally will let in nutrients. They open and close for one reason or another but at certain times the permeability is more increased, and more things get through, than what we want. Is that correct? Fasano: Nutrients are being let in all the time. Nutrients can be divided into three groups, fats, proteins and sugars. They are complex molecules. And in order to come through and be made use of, they need to be dismantled into their single elements. So for complex sugars, you have to come up with simple sugars – monosaccharides. In fats they have to come down to monoglycerides. In protein, they have to be dismantled into the building block of proteins called amino acids. If you don’t do that, you can’t bring nutrients in. And also, if you don’t digest these nutrients and they come in to a leaky gut undigested, that will really harm by instigating an immune response that leads to inflammation that can make you sick. Heather: Right, so at what point is permeability of the intestine harmful to us? Fasano: Well its not just gluten. Gluten could be our friend if it were digested, it becomes a foe if it is undigested and comes in undigested. But there’s a lot of other stuff that can be harmful, no matter what. For example, bacteria, bio-products, toxins, everything. If you have a leaky gut, this starts to come through, because there is no defense to keep these things at bay into the intestinal lumen. And that can be a problem. Heather: So if you have leaky gut, then it leads to other kinds of complications? Fasano: The problem you end up with depends on who are. Once these enemies come in, and they’re in the walls of our city, so to speak, it all depends on what kind of response and behavior of your immune system. If you are predisposed for let’s say an autoimmune disorder, you develop autoimmunity, and the kind of autoimmune disease that you develop, celiac disease, diabetes, MS, depends on who are. Other people may develop other kinds of problems. They can go from chronic inflammation to cancer to disease of the nervous system and autoimmunity and so on and so forth. So a leaky gut, a gut that doesn’t have that power to keep the enemies at bay out there, can really lead to a series of very severe, sometimes life-threatening situations. Heather: Ok. And so this new drug that’s in trials is called Larazotide acetate and its supposed to help cure leaky gut, is that correct? Fasano: Yes, that’s correct. Again, 30 years ago, we didn’t know we had doors in between cells. Then a lot of science and information has been accumulated in the past couple of decades on how these gates are made. The missing information was, what is the key that opens this gate? And our group stumbled upon this molecule almost a decade ago, which is now called zonulin. And that is right now the only “key” that we know that can open this gate. We also know that this molecule is also used in a large amount in many autoimmune diseases including celiac disease, making the intestine leaky. Larozotide is a molecule that stops zonulin. And now its been given to almost 1,000 people. Its very safe and seems to be efficacious for celiac disease and now is entering the last phase of the clinical trial, what we call the Phase 3. Heather: Great! So how does it work? You stop the zonulin from up-regulating, is that correct? And then there’s no zonulin, there’s no leaky gut? Fasano: Yeah. Go back to the parallel that this is the key. Its like putting wax in the hole where the key needs to go, so that the key cannot engage in the door, and therefore it cannot open this door anymore. Because you know, this molecule it doesn’t inhibit zonulin, but it inhibits interaction with the target cell. So that the cell is not instructed anymore to open this gate and to make the intestine leaky. So that’s pretty much the way it works. Heather: Ok. Interesting. And do we know why zonulin is released at the time of gluten exposure or anything else that would trigger it? Fasano: Yeah, we do now have information. For example, gluten by itself, by a mistake of evolution, is instructing cells to release zonulin. And therefore making the gut leakier so that gluten can really open a shortcut for itself to come from outside to the inside. And then again, what happens after that really depends on who you are. If you are genetically predisposed to develop celiac disease, that is what’s going to happen to you. If you have a genetic predisposition to gluten sensitivity that will be the outcome. And so on and so forth. Heather: Interesting. Well this is all very exciting, because leaky gut is very difficult to treat by diet alone. If one were to take this drug, could you just start eating gluten again, and let the drug do its thing? Or do you have to stay on a gluten-free diet until your gut heals? Fasano: Yeah, that’s right. It really depends. The way that this drug was designed and eventually been used for trial, was to be not a substitute for a gluten-free diet, but instead an integrative approach to the gluten-free diet. We know that one of the major problems that people with celiac disease face is cross-contamination. They are exposed to gluten inadvertently and that can create problems. We thought until the recent past that this was a rare event and now unfortunately, we learned that this is much more frequent than we previously thought so the Larazotide can be a sort of safety net, particularly when you are out of your comfort zone. So when you eat outside of your household where you have less control over the situation, you may use this so that inadvertent exposure to gluten will not be as harmful as it would be if you weren’t protected. Some people of course are looking at this pill as the panacea to go back on a regular diet. And going back to what you were saying on the spectrum of people out there, in terms of feelings about these drugs that are now in development, there are people who say, you know what, I’m just fine on a gluten-free diet, I don’t want anything to do with these drugs, and the other end of the spectrum are people who are really waiting for this holy grail to be able to go back to a regular life. I think it is somewhere in between. Use these drugs if and when it is necessary to protect you when you don’t have full control of the situation, is the best way to go. Heather: Yes, well certainly, no matter how well you try to stick to a gluten-free diet, there’s always a chance of cross-contamination, especially if you eat out in a restaurant or somebody else is cooking your food for you, so its definitely nice to have a safety net. But can it actually repair the leaky gut? You have leaky gut, and you try by diet alone to heal leaky gut but you’re having a difficult time, would this drug help to repair it? Fasano: Well leaky gut is not a permanent damage. Leaky gut is a dynamic situation, because again, in this long, 20-foot tube, you have billions of doors. Not all open at once, or all closed at once. It’s extremely dynamic. So what this pill would do is to really maintain the right balance of opening and closing that will keep you protected. But this is something that is very, very dynamic. People that suffer a leaky gut, are people that have an inappropriate number of these gates open at once, and that could create a problem. Its not that these gates are destroyed. So what Larazotide does is bring back everything to what it is supposed to be, i.e. to have the right balance between open and closed gates, so you are protected. And because it’s a dynamic process, you can’t take this pill once and fix a leaky gut. Every single time that you go out and eat, and there is a risk of being exposed to gluten, you should take the pill. That is the bad news and the good news of this molecule. Heather: I see. Ok. Well that’s good. And healing leaky gut is actually a very important process in healing the gut and reversing many diseases, but is curing or stopping leaky gut enough to reverse celiac disease or other autoimmune diseases? Or are there other actions that would have to be taken as well? Fasano: A lot of study on this molecule has been done on animal models. And it looks like blocking zonulin is instrumental to eventually prevent and treat autoimmune diseases. And that’s the goal of this clinical trial, using celiac disease as a model, can you stop autoimmunity by fixing the leaky gut? And if that’s the case, in other words, if this clinical trial will be successful, then the idea is to eventually expand this technology to other avenues of disease to which we have not treatment of disease at all, like diabetes, MS, rheumatoid arthritis, and so on and so forth. Heather: Right. Great! So on to the question everyone’s been waiting for. ImmusanT is developing a vaccine, called NexVax2, that it claims would allow people with celiac disease to eat gluten. This sounds like amazing news! Is this potential for a celiac-curing vaccine legitimate and something we actually can get excited about? Or is it really too good to be true, and the product of just another company looking to make money in a burgeoning field where they see opportunity? The way most vaccines works is to inject a little bit of an antigen into the body, in order to produce antibodies and memory cells that can fight off that particular disease. But this vaccine doesn’t work the same way, does it? Fasano: It does not. What you just described is what we call the preventive action. So in other words, you build a defense against an enemy that can come in the future. Like, for example, a mumps vaccine. You build these antibodies, you’re real enemy comes, you already have your strong defense, so you don’t get affected. Here, the challenge is to re-program the immune system so that when gluten comes in, when the immune system sees gluten, it doesn’t do anything harmful to your body. That’s the challenge. Now, on paper, this is a feasible proposition. In other words, there is a possibility to do something like this. They use specific small fragments of gluten that will be given to the individual, trying to instruct the immune system that when it sees these gluten peptides, not to create any inflammation that can harm the host. So theoretically, it’s possible. How feasible this is, and the timeline, that is the challenge. Because this has never been done before, and to use this in humans, particularly those affected by celiac disease, may take decades and its hard to predict if this will be a feasible proposition or not. Heather: Ok. Interesting. So the way that the ImmunsanT video explained it, is that the vaccine “targets the gluten-specific T cells.” So the way that I understood it then, is that we have T-cells that come in to fight the antigen, in this case, gluten, and in normal situations, the T-cells would attack the gluten, but for some reason in celiac disease and other autoimmune disorders, they’re attacking the villi, instead of attacking the gluten. Is that correct? Fasano: Partially. So in other words, you have T-cells that are soldiers defending us against some enemies. T-cells have specialized roles. There are a sub-group of T-cells that are specifically armed to fight gluten. So when gluten comes through in an individual with celiac disease, what happens with these T-cells, rather than getting rid of the enemy, so in other words, using their weapons to get rid of gluten, they start to attack their own body, or therefore starts to attack the villi there and destroy them and so on and so forth. What the vaccine aims to achieve, is that when gluten comes through, to not attack your own body, as particularly happens when you have a genetic predisposition for celiac disease, but instead to have the T-cells do nothing. Its truly a matter of reprogramming the immune system to not do anything when gluten is coming through. Heather: Right. So how does one re-program a T-cell? Is this done by inducing apotosis or T-cell death? Or does it make the T-cells inactive? What exactly does it meant to reprogram them? Fasano: The way that they are conceptualizing how to do this is to give the individual a small amount of gluten so that T-cells would get “used to” it. So that you don’t have to ramp up this huge response that creates a collateral damage and inflammation. Its like the desensitizing vaccine for people with asthma in which you give small amounts of the particular allergen that creates the asthma so that the immune system will switch from an immune response to tolerance. That’s pretty much what they are trying to do, but again, it’s a feasible proposition on paper, but in practical terms, its quite a challenge. Heather: Sure, sure. Its not something that will happen over night, I imagine. Fasano: That’s exactly right, so people that are looking for something like this as a holy grail so you can go back and eat gluten-containing foods without any problem — its something that if its going to materialize, it will not happen over night. It will take a long, long time. Heather: Sure. Well it certainly sounds good. We definitely want to stop any attack on the actual body itself. But what happens to the gluten if it isn’t being attacked by the T-cells? And I understand that everyone has some inflammatory response to gluten, not just people with celiac disease, and they can even create zonulin, I don’t know if that’s part of the process or that’s a separate process, but my question is, if we’re not raising a response to the gluten, what happens to it? Fasano: That’s the most challenging situation that NexVax2 will face. The more we study the interaction between gluten and our body, the more we realize that we really turn on all the machinery that we typically put together when we are under attack from a microorganism, let’s say a bacterium. And probably this is due to the fact that we did not evolve to eat gluten. Gluten only came in our story about 10,000 years ago. So for the vast majority of our 2.5 million years of the evolution of our species, we had not been exposed to gluten. So when we are exposed to gluten, it really looks like it is turning on all the extensive machinery that we typically put together when we are under attack from a microorganism. So to answer your question, what is going to happen when we tell the body to tolerate gluten, and to not mount an immune response, its something that I really have a hard time to tell you. Because I don’t know exactly what will be the consequences of turning off your immune system when exposed to gluten. I don’t know. I don’t know. Heather: Yeah. Well exactly. Because what I’ve always understood about inflammation is that its our way of fighting the bad guys, if you will, and of course, chronic inflammation isn’t good, it means there is an underlying condition that needs to be addressed and it can cause further complications, but if there is no inflammation, does that actually mean its safe for us? That’s my question, too. Fasano: That’s right. So we have the misconception that inflammation is bad. Actually, it’s a very, very useful process that we “engineered” during evolution to protect ourselves against the majority of enemies that we face as a species, i.e. infections. When inflammation is confined, and well controlled, it creates a very harsh, un-friendly environment for bacteria to survive in. Because you increase the temperature, there are certain chemicals called cytokines that are very harmful to bacteria. In other words, you create conditions that bacteria cannot reproduce in, and therefore they die. They don’t infect you. And this process happens every day. We are not aware of it, because our immune system is very tightly controlling inflammation, but we are exposed to bacteria, I mean tons of them, on a daily basis and we rarely as a consequence develop and infection. Why? Because our immune system, with its very tightly controlled inflammatory processes, is protecting us. So inflammation, when it’s under control, is a good thing. The problem is when it goes out of control, and it becomes chronic. It becomes spread throughout the body and turned on all the time, and this is the situation that people face like people with celiac disease – they have this chronic autoimmune condition. So again, I’m not sure what would be the consequences of if you can turn off only the T-cells that react to gluten. Are we going to be in trouble because now we are more susceptible to other problems because gluten has not been taken care of? I don’t know. Heather: Sure. And plus, what I also read is that it only targets the T-cells that reacts to alpha-gliadin, gamma-gliadin and barley hordein. But there are 50+ other gluten fragments peptides that can trigger a T-cell response, plus rye prolamin, and glutenin. So I guess if someone reacts to any of these other gluten fractions, that the vaccine is not targeting, that could also be problematic, couldn’t it? Fasano: Yes. It is. The people that conceptualized the vaccine, particularly, Dr. Bob Anderson, provided evidence that those three or four peptides that they are going after are the main ones, at least for the people that have the HLA-DQ2 gene. Of course the vaccine that they are experimenting with now will not work for people that have the DQ8 gene, the other gene that is linked to celiac disease. So that’s another challenge that needs to be considered. Heather: And how about isoforms, like HLA-DQ2.5, like for people who have lupus, would it be able to help them? Fasano: Yes, it should theoretically work for the isoform. Heather: So then can you describe the clinical study itself a little bit, such as how long is it going to take, who are going to be selected as patients for the research, etc.? Fasano: The pipeline to develop a drug or vaccine is pretty much standard. So I can definitely tell you how they do it. First and foremost, there is a lot of work before they can do anything to humans. So to make sure there have been some clinical studies to show that it is safe — that is the most important concern, that there is some efficacy to the rationale of the drug or vaccine. If and when you reach that point, then through a very tightly scrutinized processed by the Food and Drug Administration, you will be given the ok to start your clinical trials. They are divided into three phases. Phase 1 in which the only goal is to show safety. So in other words, the drug or vaccine does not have side effects that will make it incompatible to be used for human purposes. And in general, these studies are done on normal, healthy individuals, because the goal again, is just to establish if the drug or vaccine is safe. If the drug and/or vaccine is shown to have indeed no side effects, then you can start to move to Phase 2, where now you have more patients involved, now you have the real patients, in this case people with celiac disease, now you have a longer time of exposure, and you have to show there is some dose response curve. Then if you complete Phase 2, you eventually get to Phase 3, that is, a very large study before it goes to the market. Now, in general, it takes between 10 and 15 years to develop any drug. It takes up to a billion dollars to develop any drug. And the process is extremely inefficient. So of a thousand molecules that start the process only 2 or 3 will reach all the way to the end of Phase 3. So in the current landscape of drug and vaccine development in celiac disease, the one in the most advanced phase is Larazotide. It is starting, right now, the Phase 3 trial. And then there is another drug that is based on some enzymes for bacteria to completely dismantle gluten so that it will not be toxic and they are in the Phase 2-b trials so they are a couple of years behind the Larazotide. * And finally this vaccine, this NexVax, is just starting the Phase 1, not too long ago so it’s at the early stage. And of course the earlier the stage, the more risk there is that its not going to reach the final destination. Heather: Ok. So we still have a long road ahead of us on this. Fasano: Uh yeah. I mean, best case scenario, Larazotide can be on the market in two or three years. But that’s it. And that’s typically not the case. I mean one more economic crisis and everything will stop. Because these are very costly studies. When you reach the phase 2-3, do you have the millions of dollars it takes to run these clinical trials? Heather: Right, so obviously you recommend that people still stick to their gluten-free diets, then until this comes out, right? Fasano: Oh absolutely! No question about that! Heather: And speaking of the gluten-free diet, you say in your book that a large percentage of celiacs don’t completely heal even when they are being compliant with the gluten-free diet. In fact, up to 92% of celiacs eating a traditional gluten-free diet, that avoids just wheat, barley and rye, never heal! That’s a huge percentage! You also co-authored a paper that shows a that a diet free of all grains except rice reduced that number to 20%. That is, 80% of celiacs who followed a mostly grain-free diet DID heal! And personally, I wonder if those other 20% might have healed if they were also not eating rice. Since we know that some people can cross-react to rice. So my question is, why aren’t more leaders in the gluten-free and celiac community, such as yourself, advocating for a grain-free diet (or a diet free of trace-gluten-contamination) instead of just gluten-free, when the traditional gluten-free diet as we know it, has a very low performance record? Fasano: Ok so let me clarify a few points and make sure that we are on the same wavelength. Fasano: The gluten-free diet is by default and by definition THE treatment for celiac disease sufferers. No question about that. The question here is not if this is the diet. The question is the efficacy of this diet. We were under the impression that this was extremely good in controlling the celiac disease process. And unfortunately, as you’ve correctly mentioned, we were mesmerized by learning that a lot of people, they go on a gluten-free diet and they believe to being doing the gluten-free diet well, and it turned out to be that people had sub-optimal compliance or lots of exposure to gluten due to the fact that we lead a lifestyle that puts us at higher risk of cross-contamination. Because you know, I want to assume, that if you cook food at home, you are not cross-contaminated there, because you are totally under control of the situation. So if cross-contamination happens, it is when you are outside your household. Heather: Well there was actually a study that was done that showed that 1/3 of all of our inherently gluten-free grains like rice or quinoa, actually do contain gluten in them, so if you’re buying quinoa or rice to cook at home, you could still be cross-contaminating yourself, even if you’re not going out. Fasano: True, true. But again, I want to make perfectly clear, the general rule is if you do the stuff correctly and you use grains that are gluten-free, intrinsically gluten-free, like rice, that are not cross-contaminated, you should be under control. Now the problem again, is also that we in the past ate in a totally unregulated situation, in which some of the stuff labeled as gluten-free, or any substitute that is intrinsically gluten-free, there was no tightly controlled regulation until 2013, when the Food and Drug Administration came up with its ruling. And let me speak to the second point. When you said that it needs to be not only gluten-free but grain-free, once again its not because of maize or rice intrinsically containing molecules which are harmful to people’s immunities, its simply because they are cross-contaminated. That’s what it is. Nothing else. Now that more attention is paid on this cross-contamination, and also because there are liabilities attached to it, I hope that in the future we will see less of this situation in which I believe to be safe by eating rice, but actually I am not, because its been cross-contaminated therefore I’m harmed by ingesting what is supposed to be a safe grain when its not. The third point I want to make is the non-responsive celiac disease is yet another category of individuals. These are the people that are on a strict gluten-free diet, but they do respond. They still have severe symptoms. Its like the gluten-free diet is not working for them. And its roughly 10% of these individuals. ** These are the people that, even if they scrutinize very closely their diet and they’re not cross-contaminated, their immune system is still on and still creating damage. The way that we understand it is, the vast majority of this 10% of these people, so 9 out of 10 of these people, are in this situation because the immune system is “super sensitive” to gluten. So while the vast majority of people with celiac disease will not feel the 20 ppm or below of gluten, and therefore will not react with something that can be harmful, in this individual, even 10 ppm can create a problem. And therefore they need to be on a very special diet in order to get the immune system under control. We call it the Fasano Diet, which is described in my book. It is a diet in which only naturally gluten-free foods are allowed. A lot of persons out of 10 that will not correct have what we call the refractory sprue, so in other words, these people now have an immune system which goes on automatic, and will not be dependent on gluten exposure anymore. It will be always on. The immune system will always be turned on and it will not be able to be turned off by the gluten-free diet. Heather: But it is still the majority of celiacs that are in that non-responsive celiac disease class, is it not? Fasano: If you take 100 people with celiac disease, 90 respond to a gluten-free diet, no problem. ** Ten are not responsive, meaning their symptoms are still there, and of these 10, one has refractory sprue, the other 9 they can resolve if they are put on a special diet. That’s pretty much the landscape of the situation. Heather: Ok. So, given all the research on non-celiac-gluten-sensitivity, gluten’s limited nutritional qualities, as well as the fact that, as you yourself state, gluten causes an immune response in everyone, do you still recommend a gluten-free diet only for those officially diagnosed with celiac disease? Fasano: I do. And the reason why I do is because the core goal here is quality of life. And if you do have a problem with gluten, that will go away when eating gluten-free, of course you have a gain in terms of quality of life by embracing the gluten-free diet. But if you do not… you have this inflammation caused by gluten but it doesn’t translate into a clear outcome you have no return on investment in going gluten-free. And going gluten-free is not a walk in the park. Its going to be a negative impact on your quality of life that you will not have a return on this investment unless something will change in terms of you feeling better by going gluten-free. Going back to what I was saying before. Gluten turns on the same machinery that we use to defend against attackers like bacteria. And we are under attack all the time. As a matter of fact this weaponry is on all the time, because we are inundated by bacteria. Nobody would say, you know what, because we have this ongoing inflammatory fight, we need to sterilize ourselves. That would not make any sense. And actually maybe in the long-term it might be detrimental, because this ongoing inflammation also trains the immune system to be ready when it’s under attack with serious enemies that can really, really put us in danger. So when its all controlled and you don’t have problems, like what happens with the vast majority, 99% or 90% (I don’t know the numbers) of people in the world, that ongoing fight can be good. Heather: Right. But there have been some studies that show gluten can effect the brain, even without damage to the intestines, like Hadjivassiliou et al. published in the Lancet in 2010. There are ways that gluten can affect us without us having celiac disease and so that’s my concern is that wouldn’t it still be advisable to some people to take gluten out of their diets? Fasano: Wait a second. You’re talking about something outside of celiac disease. And you also mention something that I definitely embrace as a concept. You are talking about people with gluten sensitivity and I completely agree that you can have an inflammation that can be dangerous not only in your gut but anywhere in your body, the brain, the joints, the nerves, the skin and so on and so forth. Those are the people that definitely need to embrace the gluten-free diet. Because I really do believe that people with Non-Celiac-Gluten Sensitivity need to embrace the gluten-free diet. If I understand your question correctly, if everybody should eliminate or reduce the gluten intake, my answer is, I don’t think so, because again the vast majority (I can’t put a number on it), but lets say, 80% of people in the world can eat gluten without having any consequences. So I think its ok to stay on a regular diet. For the ones that have a problem when they are exposed to gluten, by all means, they should eliminate gluten. Heather: Sure. So I agree with you there. Not everybody, necessarily, needs to take gluten out of their diet, but if they have gluten sensitivity, which they don’t have an official diagnosis of celiac disease, but they could have gluten sensitivity, then they should take gluten out of their diet, too. And I guess that’s the difficult thing now, is to figure out how do we know if someone has gluten sensitivity or not? Fasano: That’s right. And the reason why its difficult is because, unfortunately, contrary to celiac disease, we do not have, yet, validated tests for the diagnosis of gluten sensitivity. Hopefully we will have these tests available, too, and that will resolve the problem, but I want to refresh your memory here, that celiac disease was first described officially in 1861. The first test for celiac disease became available in the 1970’s. So more than a century later. So we are at the very early stage of understanding gluten sensitivity. I hope it will not take another century to develop a test for gluten sensitivity! But this is an ongoing process, so hopefully will we have this test sooner rather than later so that we can make diagnoses based on evidence. But right now, the only way that we can make the diagnosis is by exclusion criteria, in other words, you have to rule out other reactions, like celiac disease and virology, to make sure that it is indeed exposure to gluten that is the reason why people have these symptoms. Heather: Well there’s a lot to learn and I think we’ve come a long way in a short amount of time. And I know that you are one person that is responsible for making a lot of that happen. So I really appreciate all the work that you’ve done and I also really appreciate you taking the time to talk with me today, Dr. Fasano. Especially during a winter blizzard! Fasano: My pleasure! Take care now. For more information on these drugs, please visit the company websites, ImmunsanT and Alba Therapeutics. To follow them through their clinical trials, please visit The US National Institutes of Health Clinical Trials website. *We did not get into the details of this third drug that he mentions. It is called ALV 003, which is being tested by Alvine Pharmaceuticals, and they are recruiting for Phase 2-b clinical trials now. If you would like to learn more about them, please visit their website here: https://alvinepharma.com/. **Dr. Fasano’s percentage of response rates are completely different to the response rates that are cited in the medical literature. For an explanation of why this is, and what the real response rates in celiac disease looks like, please see The Vast Majority of Celiac Patients Aren’t Healing on a Gluten-Free Diet. Next PostWhy We Get Fat: And What to Do About It. Book Review. I heard Dr. Fasano in 2007 at a nursing conference in Sioux City Iowa. He is a wonderful man in the world of autoimmune diseases and Celiac’s Disease. Thanks for the information on his progress. Candi, diagnosed in 2005 with CD. Thank you very much for sharing this interview. It’s a ray of hope that there might some day be protection from cross-contamination, which is the biggest problem with having celiac disease (as I see it). But this was startling to read: “1/3 of all of our inherently gluten-free grains like rice or quinoa, actually do contain gluten …” What level of contamination do the other grains have? If it is 2 ppm or less, then it is not so scary, but if it is often more, that is cause for concern. Does anyone know whether, if I cook rice at home and rinse it well before using it, that will get rid of enough of any contamination to make it safe? And likewise with other grains? Yes, unfortunately, that it is true. Here is the reference to the study that shows 32% of our inherently gluten-free grains are cross-contaminated: Thompson T, Lee AR, Grace T. Gluten contamination of grains, seeds, and flours in the United States: a pilot study. Journal of the American Dietetics Associaton. 2010 Jun; 110(6):937-40. And if you want more information about this you can follow https://www.glutenfreewatchdog.org/ where they test gluten-free products for contamination. Which grains are contaminated and which aren’t, is not easy for the general to know. Its could be brand specific as well. I would hope thoroughly washing rice would get rid of gluten, but gluten is known to be a sticky substance, so its hard to say for sure. That’s why I usually recommend people who are new to gluten-free, OR who have been gluten-free for a while but still aren’t feeling better, to take all grains out of their diet until they start to feel better. Once you feel that you are healing, then you can slowly experiment by bringing rice (etc.) back in and seeing what happens. The interview was excellent! I can’t wait for some medication. Celiac has not been fun. Multiple glutenings from airborne flour and one from airborne drywall dust when a door opened to an office under construction as I walked by. Glutenings from beef that was obviously contaminated. ttg going from 2.8 to 6.8 from one year to two despite being obsessively GF. Difficulty in meeting friends for dinner. Regardless of the price, I will be first in line for any medication on the market! Maybe I’ll be able to travel, eat out, and do the things I enjoy again instead of sitting at home way too much!